Theodora, empress of Arta (Epiros) in the thirteenth century by virtue of her marriage to Michael II Komnenos Doukas (reigned ca. 1231—ca. 1267/68), lived at a time when the Byzantines/Romans had lost their capital of Constantinople to the Latins of the Fourth Crusade, and the empire had divided into three successor states in exile, based in Trebizond, Nicaea, and Epiros. According to her life, Theodora was a baby when Theodore Komnenos Doukas was emperor at Thessaloniki, that is, at some point between 1224 and 1230. She married Michael II shortly after he became ruler of Epiros in ca. 1231. Thus, if one follows the chronology of the life, she must have been born ca. 1225, and married Michael at a tender (and canonically illegal) age. 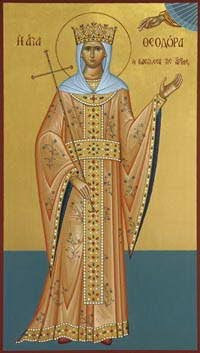 The birth of her first son Nikephoros is usually placed ca. 1240, when she would have been about sixteen. She is said by the life to have survived by several years her husband, who died in 1267 or 1268. Therefore her death must have occurred in the 1270s. There is no doubt that Theodora was a historical figure, since she is mentioned on several occasions by George Akropolites. In 1249, for example, she journeyed to Anatolia with her son Nikephoros for his betrothal ceremony to Maria, granddaughter of John III Vatatzes and daughter of Theodore II Laskaris. In 1256 she accompanied her son to Thessaloniki for the long-delayed wedding, in exchange for which Theodore II demanded the cession to the Nicaean Empire of Dyrrachion and Servia (Theodora’s hometown). Theodora was a woman who entered monastic life after being widowed, who had previously suffered abuse at the hands of her husband. Thus marriage was not a hindrance to attaining sanctity. Theodora’s most distinguishing feature was her noble endurance of her five-year exile from Arta with no complaint although she, a former empress, was reduced to picking wild greens in the fields. After her reconciliation with her husband, she founded a convent in Arta and adorned the church with offerings. She is said to have borne the following attributes of sanctity: asceticism, philanthropy, foreknowledge of her death, and miraculous posthumous cures at her tomb. The story of her life evidently evinced a sympathetic and admiring response among the people of Arta, for her tomb began to attract popular veneration soon after her death and continues to do so to the present day. Her memory is celebrated on 11 March. The short life of Theodora translated here by Alice-Mary Talbot (Holy Women of Byzantium) is attributed in the fifteenth or sixteenth-century manuscript, Venice, Marc. Nan. 71 [ Marc. gr. II 50], to the monk Job, who has been identified by S. Petrides and L. Vranouses as Job Iasites, who lived in the second half of the thirteenth century and served as adviser to the patriarch Joseph I. This celebrated and blessed empress Theodora was of a family from the East;1 her parents were John and Helena. Her origins were as follows: while Alexios,2 a descendant of the Komnenoi family, was ruling the Romans, Michael Komnenos,3 who was related to the emperor himself and to the emperors that bore the name of Angelos, was entrusted with rule over the Peloponnesus. And Senacherim4 was sent to Aitolia and Nikopolis. They originally married two first cousins, who were blood relatives of the emperor. And John, the father of the blessed Theodora, whose surname was Petraliphas,5 being of distinguished and splendid lineage, was married by the emperor to a woman [Helena] who was a member of one of the leading families of Constantinople. After being honored with the title of sebastokrator6 of the Romans, he was appointed to rule over Macedonia and Thessaly. But alas, with God’s forbearance, the Latins conquered Constantinople, and the emperor Alexios was taken captive by them together with many others.7 And the boy Laskaris was blinded in Anatolia by Michael Palaiologos, who then seized the throne;8 and everything was filled with tumult and confusion. Then Senacherim was plotted against by the inhabitants of Nikopolis, and summoned Michael Komnenos to help him; but before he arrived, Senacherim was murdered. When Michael arrived, he killed all the murderers. And he married Melissene, the wife of Senacherim. For he had previously lost his own wife who had died. And he appropriated for himself all of Senacherim’s wealth as well as his political power. When the Latin fleet came down from Constantinople and anchored in the harbor called Salagora,9 Michael Komnenos ransomed the emperor Alexios, whom the Latins had taken as a slave, since they did not recognize him; and Komnenos secured his release, after lavishly bestowing many gifts upon them [the Latins] first.10 Wherefore the imperial authority was given by the emperor Alexios III as a bequest to Michael and his descendants. Four sons were born to him and Melissene: Michael Doukas, Theodore, Manuel, and Constantine.11 The eldest son Michael,12 after the death of his father, took on all his rule. He was an energetic man, sharp-witted and a skilled administrator. He conquered Bellegrada and Ioannina and Bonditza.13 He also acquired the island of Corfu and Dyrrachion and Ochrid,14 and all of Vlachia and Hellas,15 and greatly expanded the extent of his territory. But he soon fell victim to the sword and died,16 leaving his brother Theodore Doukas17 as his heir. And Theodore disregarded as immature his brother’s son, Michael Doukas,18 inasmuch as he was a small baby. So he seized total power and, elated at his good fortune, devised a treacherous plot against the child. But when his mother found out about it, she forestalled it by traveling with the child to the Peloponnesus. Theodore was shown to be very experienced in battle, and after freeing Thessaloniki from Latin tyranny, he was proclaimed emperor.19 And he held sway over all of the west as far as Christoupolis.20 Meanwhile the sebastokrator Petraliphas, after bearing sons in Thessaly, became the father of Theodora, who is deserving of eternal memory. And coming to the end of a life in Christ,21 he left his power to his sons. And they skillfully served the emperor Theodore, protecting their baby sister as the apple of their eye. What happened next? The emperor went on campaign in Zagora,22 and made war against Asan, the emperor of the Bulgarians. 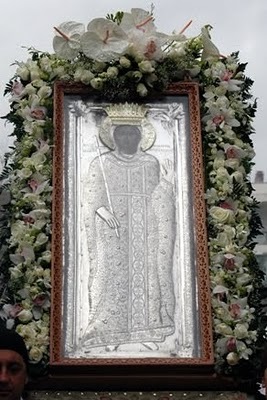 And he was defeated and taken prisoner by him, and deprived of his sight.23 Michael, who was already a young man, was recalled from exile, and after inheriting all his father’s territory, went to Vlachia.24 And when he arrived at the castle of Servion,25 he saw the beautiful young Theodora, and was completely smitten with her. He entered into an agreement with her brothers (of the Petraliphas family), took her as his lawful wife, and returned with her in brilliant style to Akarnania,26 which was at that time unfortified. And he concerned himself with ruling his own territory. As for Theodora, she was neither carried away by her newly acquired glorious position, nor did she succumb to her youth, nor did she indulge in luxury. Neither was she puffed up by pride in her imperial power. Instead she decided to devote herself to God, to cultivate the pursuit of virtue, and to conduct her life in a chaste manner. So she embraced humility, avoidance of anger, love, meekness, compassion, and mercy, being successful above all others in her quest, and always venerating God with her entire soul. But the enemy of the righteous [i.e., the Devil] could not in any way endure to see this, nor could he bear to see this admirable course of the young woman. So he took up weapons against her, and made her husband weak with lust for women; and thus he brought upon the blessed Theodora the worst trial of any that have ever been recounted. For Michael was consumed with lustful passion for a noblewoman named Gangrene, and as his sanity was beguiled by her sorcery, he developed an implacable hatred for his own wife. And after he rejected her, in an insane fashion he took this maenad as his consort. And he issued a decree to his subjects that they should not support Theodora, nor should they deem her worthy of any veneration, nor even mention her name. When the noble Theodora was afflicted with these tribulations, she was not at all swayed in her purpose, nor did she deviate from her excellent way of life, but endured like adamant, continuing to venerate God in the same manner. Driven into exile, she lived in the open air, made wretched by the cold and the burning heat. Oppressed by hunger and thirst and other hardships, she was anxious to find shelter. Contending for five years with boundless hardships, she neither uttered an ignoble word, nor did she neglect to say a word of prayer to the Lord, but strove for virtue to an even greater extent, and every day was exalted to Him, lifting herself up through her endurance. She was also carrying a baby27 in her arms, since she was pregnant with him when she was sent into exile. A priest from the village of Preniste,28 who found her picking wild greens in a field, while holding her baby, inquired of her with oaths to tell her name. And when he learned her identity, he took her home and concealed her, deeming her worthy of every consideration. Then the magnates and leading officials of Michael Doukas suddenly seized that malicious woman [Gangrene] and after they suspended her in the air, the whole wicked affair came to light. And when Michael came to his senses, he was thoroughly shaken, and he took the blessed Theodora again into his house. And all things were filled with joy and rejoicing. Thereafter they both spent their life in peace and love for God, taking care for their own salvation. And they were honored with the rank of despotes,29 and bore children, and were elevated to a height of great glory, and both fought the good fight for virtue. When the celebrated Theodora saw the despotes, her husband, establish two very beautiful and sacred monasteries, called the Pantanassa30 and the Panagia,31 she erected a holy monastery to the great martyr George and established it as a female convent.32 When her husband the despotes Michael departed to the heavenly abodes after leading a good and pious life,33 she immediately donned the monastic habit. And living on for years, she adorned the church in various ways and beautified it with offerings and liturgical vessels and vestments. She also enhanced the piety of her life, training herself with toilsome labors and increasing the fruit of her virtues. She spent her time in vigils and all-night stances, conversing with God through psalms and hymns; she wore out her body with fasting, and served all the nuns unceasingly, and acted as champion of those who were wronged. She helped orphans and widows, assisted the poor, consoled the oppressed, and with humility of heart was everything to everyone.34 And when she foresaw her death, she tearfully entreated the all-pure Mother of God and the all-glorious martyr George to mediate with God for an additional six months35 in order to complete the church, which came to pass. And when her appointed time arrived, she summoned the nuns; and after instructing them well on necessary matters, and praying for their salvation, she joyfully delivered her spirit into the hands of God. And she was buried in the monastery which she had erected. And when God glorified her later, she was seen to work many great miracles, healing the sicknesses and diseases of those who approached her tomb, and driving demons from humans, and curing all sorts of incurable afflictions on a daily basis. She also healed the disease of cancer, and performed and continues to perform other awesome marvels, countless in number. For when she is invoked, she comes not only to those who prostrate themselves at her holy tomb,36 but also to those near and far and at sea and on islands and at the ends of the earth, and helps them warmly. And may we be deemed worthy to attain salvation through her holy prayers to God and enjoy the lot of those who are saved in the kingdom of heaven. Amen. 1. This is a puzzling statement, since the Petraliphas family originated in Italy; their 11th-century eponymous ancestor, Peter of Alifa (a town in Italy near Caserta), participated in the First Crusade and settled at Didymoteichon in Thrace. Perhaps "east" refers to eastern Greece instead of Anatolia or the Levant, its normal meaning. 2. Alexios III Angelos, Byzantine emperor from 1195 to 1203. His great-grandfather was Alexios I Komnenos, whose daughter Theodora married Constantine Angelos, the first-known member of the Angelos family. 3. Michael Angelos Komnenos Doukas, sometimes called Michael I Angelos, was the first ruler (1205–15) of an independent Epiros following the fall of Constantinople in 1204. As the illegitimate son of the sebastokrator John Angelos Komnenos, he was first cousin of Alexios III Angelos. In 1204 he was governor of the Peloponnesus. 4. Little is known of this man, except that he was governor of the theme of Nikopolis (on the western coast of Epiros) and was married to a member of the Melissenos family. He was murdered late in 1204. Cf. Loenertz, “Origines,” 377. 5. John Petraliphas, the sebastokrator, served as governor of Thessaly and Macedonia during the reign of Isaac II Angelos (1185–95, 1203–4); according to the vita, he died while Theodore Angelos was emperor in Thessaloniki, i.e., between 1224 and 1230. 6. A very high title normally conferred on a member of the imperial family. 7. Actually Alexios III fled Constantinople in July 1203 before it fell to the Crusad- ers. The hagiographer may have confused Alexios III with Alexios V Doukas (Mourtzouphlos), who was briefly emperor at the time of the Latin conquest in April 1204. Later that year Alexios V was captured by the Latins and thrown to his death from the Column of Theodosios. 8. The hagiographer, who has totally confused the chronological sequence of events, is here referring to the blinding of the youthful John IV Laskaris, heir to the empire of Nicaea, by the usurper Michael VIII Palaiologos in 1261. The blinding took place after, not before, Michael’s seizure of the throne in 1259. Subsequently the Lascarid prince was imprisoned in the fortress of Dakibyze in Bithynia. 9. The harbor of Arta, 17 km southwest of the city. 10. Alexios III, who had fled the capital in July 1203, was captured by Boniface de Montferrat in late 1204. He was held captive in Montferrat until his ransom by Michael I in 1209 or 1210. 11. Again the hagiographer is confused: he has added an extra generation. Michael, Theodore, Manuel, and Constantine were the sons of the sebastokrator John Angelos Komnenos. 12. This is Michael I Komnenos Doukas, who was Melissene’s husband, not her son. 13. The date of Michael’s conquest of Bellegrada (Berat) in Albania is unknown. 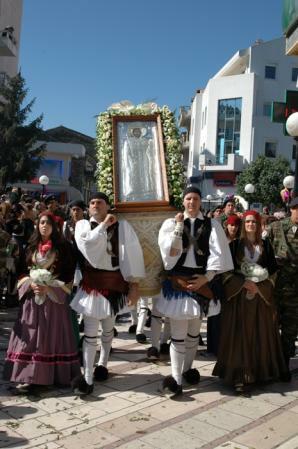 Michael was granted the region of Ioannina in a treaty of 1210 (Nicol, Epiros I, 30–31). He had taken the fortress of Bonditza (Vonitsa) on the Ambracian Gulf by 1207. 14. Corfu fell to Michael ca. 1214 and Dyrrachion in 1213, while Ochrid was captured by Michael’s successor, Theodore Komnenos Doukas, in 1216. 15. Vlachia must here refer to Thessaly (cf. Loenertz, “Origines,” 367–68), and Hellas to south central Greece (north of the Gulf of Corinth). Michael took Salona in 1210, Larissa, Velestino, and Demetrias in 1212; cf. Nicol, Epiros I, 34–41. 16. Michael I was murdered by one of his servants at Bellegrada (Berat) ca. 1215. 17. Theodore Komnenos Doukas, ruler of Epiros from ca. 1215–30. He was actually Michael’s half-brother. 18. Michael, who was to become Michael II Komnenos Doukas, was actually about nine or ten when his father was murdered. 19. Theodore recovered Thessalonike from the Latins in 1224 and was subsequently proclaimed emperor. 20. A seaport in northeastern Greece, modern Cavalla. 21. The exact date of John Petraliphas’ death is unknown, but it must have been be- tween 1224 and 1230, while Theodore Angelos was emperor in Thessaloniki. John’s sister Maria was Theodore’s wife; hence Theodora and her brothers were the niece and nephews of Theodore. 22. In this context, the toponym seems to be a synonym for Bulgaria. 23. Theodore went on campaign against the Bulgarian tsar John Asen II (1218–41) in 1230, but was defeated at the battle of Klokotnica (located on the road between Adrianople and Philippopolis), captured and blinded. The Bulgarians soon conquered Didymoteichon and many other towns in the southern Maritza valley; cf. Nicol, Epiros I, 109–11. Theodore was succeeded as ruler of Epiros by his nephew, Michael II Komnenos Doukas. 25. A city in southern Macedonia (or northern Thessaly), also called Servia and Serblia. It had fallen to the Latins in 1204, but was recovered for the Greeks ca. 1216 by Theodore Komnenos Doukas. It may have served as the headquarters of the sebastokrator John Petraliphas when he was governor of Thessaly and Macedonia. 27. The future Nikephoros I Komnenos Doukas, the eldest child of Michael II and Theodora. 28. Also called Prinista, a village on the slopes of Mt. Tzoumerka (modern Korpho- vounion), 9 km north of Arta. 29. Despotes was one of the highest titles in the Byzantine hierarchy, here applied to the ruler of Epiros. 30. The ruins of the church of the Pantanassa are found 13 km northwest of Arta, near Philippias. 31. 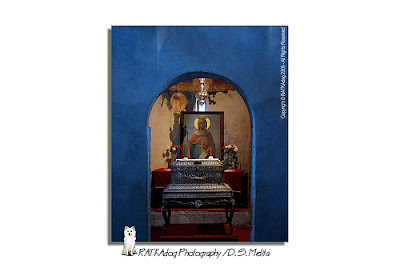 The church of the Kato Panagia is located 2 km south of Arta. The patronage of Michael II is proved by monograms on the exterior walls. 32. 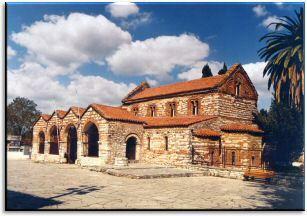 The convent of St. George later took the name of St. Theodora. Theodora may have founded the convent, but the three-aisled basilica dates to the mid–12th century. She added a domed narthex to house her tomb. 33. Michael II most probably died in 1267 or 1268. 35. Cf. with Hezekiah, who was granted an additional fifteen years of life as a result of his prayer to the Lord (4 Ki. 20:1–6; Is. 38:1–5). 36. A reconstruction of this tomb can still be seen today in the narthex. It incorporates a marble slab depicting Theodora and a small figure (probably her son Nikephoros) flanked by archangels; cf. Nicol, Epiros I, 202–3. Pazaras assigns a late 13th-century date to the relief slab, while Orlandos and Nicol think it is a copy of a 13th-century original. 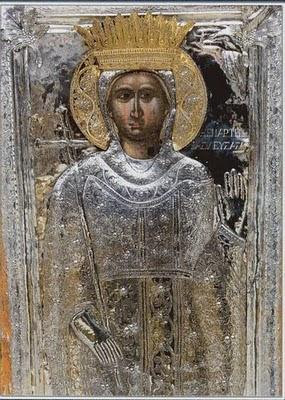 An article which has recently appeared challenges the traditional identification of the figures sculpted on the tomb, and proposes that they represent instead Theodora’a daughter-in-law, Anna Kantakouzene Palaiologina, and her son Thomas; cf. B. Cvetkovic, “The Investiture Relief in Arta, Epiros,” ZRVI 33 (1994), 103–13. You abandoned royal honors, living in chastity and pains and asceticism, and were truly filled with divine gifts, O Venerable Theodora. Because of this Arta harmonically praises you crying out: Glory to Christ Who glorified you. Glory to Him Who crowned you. Glory to Him Who works for us through you healings for all. You forsook royal honor and glory, and spent your life in asceticism, O Theodora most-blessed, honor and adornment of Arta, therefore bowing before your sacred relics, we partake of blessings from them, praising Christ Who glorified you. Rejoice the pride of rulers, rejoice holy boast of the people of Arta, rejoice treasury of heavenly gifts, O Venerable Theodora, worthy of honor.